IM2MEDIATE is a research project investigating the dynamic interplay between media representations of recent non-EU immigrants in the EU, with specific emphasis on the situation of refugees and the governmental and societal (re)actionsto it. Within this large project funded by Belspo, our study engages with the experiences of refugees. Taking a voice-centered approach, we have worked with 44 participants of Syrian, Afghan, and Iraqi descent, who came to Belgium after 2015. The study included ethnographic conversations, focus group interviews, and visual workshops with photo elicitation and photovoice exercises. 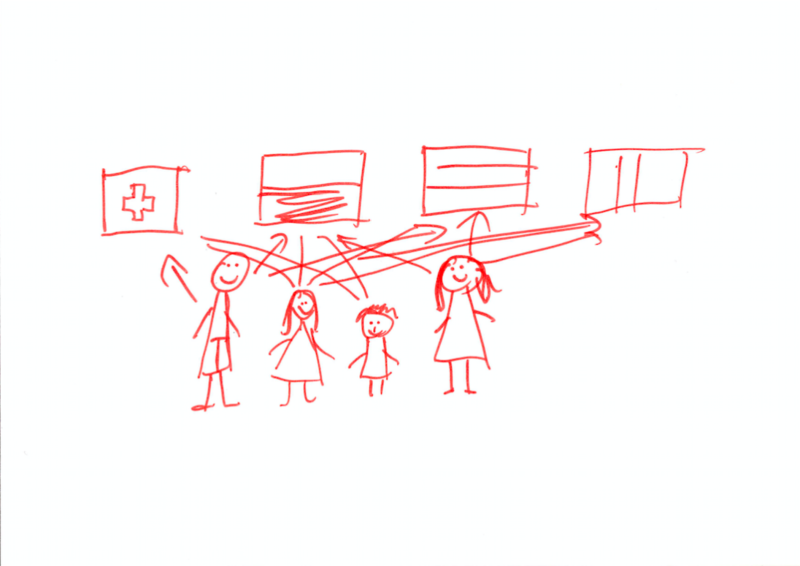 These different methods were used to elicit participants’ stories about their journeys and experiences, but also to explore their responses to mainstream visual representations of migration and refugees. Our analysis included an inquiry into negotiations of victimization in everyday life contexts, the meanings and difficulties of visual representations of suffering, and critiques of the Western gaze in media representations of migration. During a part of our study, we presented participants with a representative sample of mainstream representations of refugees and asked them to “give voice” to one or more of the persons being depicted. 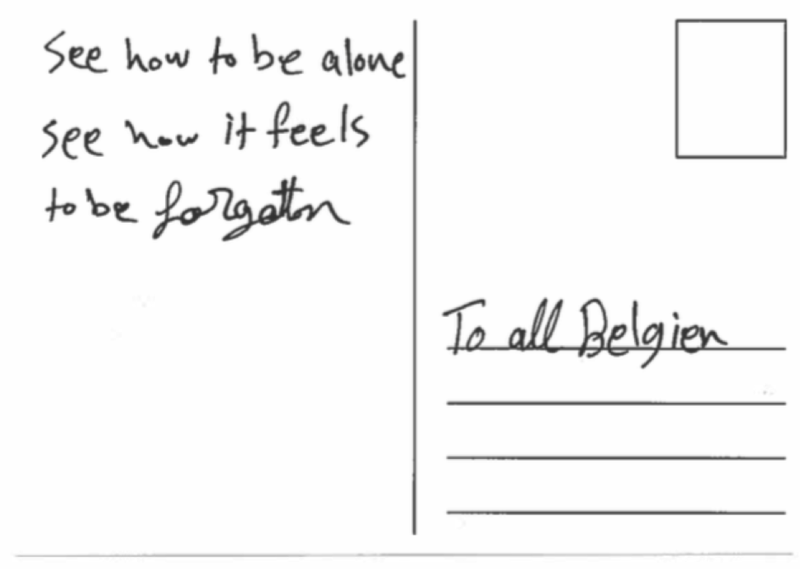 Some participants used this exercise to problematize the way in which refugees are portrayed and used this opportunity to address “all Belgians” or politicians. The images thus functioned as a helpful springboard to address broader issues related to migration, politics, and culture. The Brexit vote engendered a sense of fractured nationhood in Wales. Wales voted to leave the European Union, however, the regions of Ceredigion, Cardiff and Gwynedd voted to remain. A key point of persuasion in the media and Brexit campaign was migration. This project explored representations of migration in Wales, both historically and in the current climate, in these three remain regions. There was an analysis of local print press media around migration to examine the positioning of migrants and the dominant competing discourses. 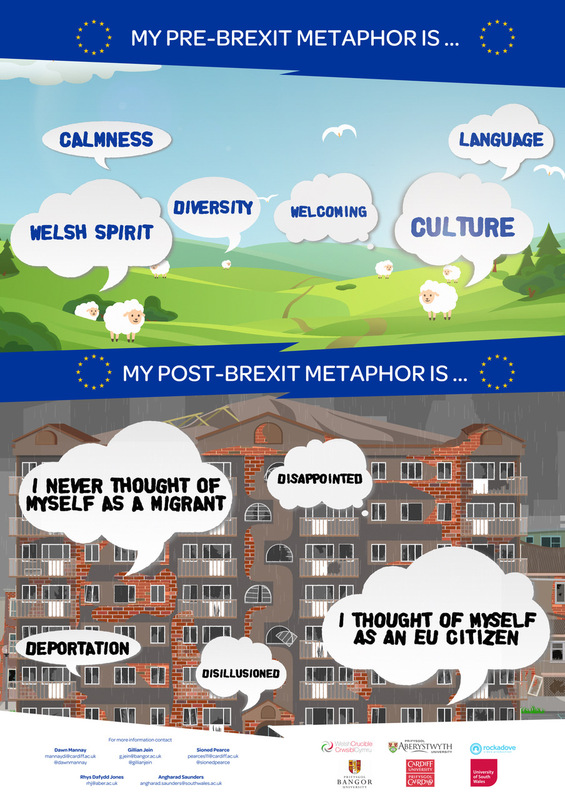 Interviews with migrants explored how they felt they were positioned by wider Welsh society and how the temporal shift between pre- and post-Brexit have impacted on their everyday experiences. Interviews involved pre-tasks where participants worked with a pictorial timeline to reflect on these shifts and created a metaphor to represent their experiences. There was also a photo elicitation activity where images from recent media reports leading up to Brexit were introduced and explored. The findings from the study are presented in multi-modal forms, including an animated short film and two posters, to increase their accessibility and address issues of impact and engagement. You can see an animated film reflecting on the project here. question “How is it for you to be a mother in Birmingham/Munich?” to which each woman responded visually. This creative exercise, conducted with colorful felt-tip pens on white sheets of paper, has yielded most interesting narrations on migration, childrearing, and the urban everyday. You can see the drawings accompanied by excerpts from image elicitation interviews here.